Labor Day is in the rear-view mirror and many of us can now turn our attention to our hunting leases and preparing them for another great fall hunting season. The American Hunting Lease Association has proudly protected our members and their landowners for the last 5 years with an affordable and comprehensive Hunting Lease Liability program that gives everyone involved genuine peace of mind. If you haven’t purchased your lease coverage yet, it is never too late. Before you hang that stand, hike through rough terrain or use any kind of firearm, make sure that your family is protected in the event of an unforeseen accident. 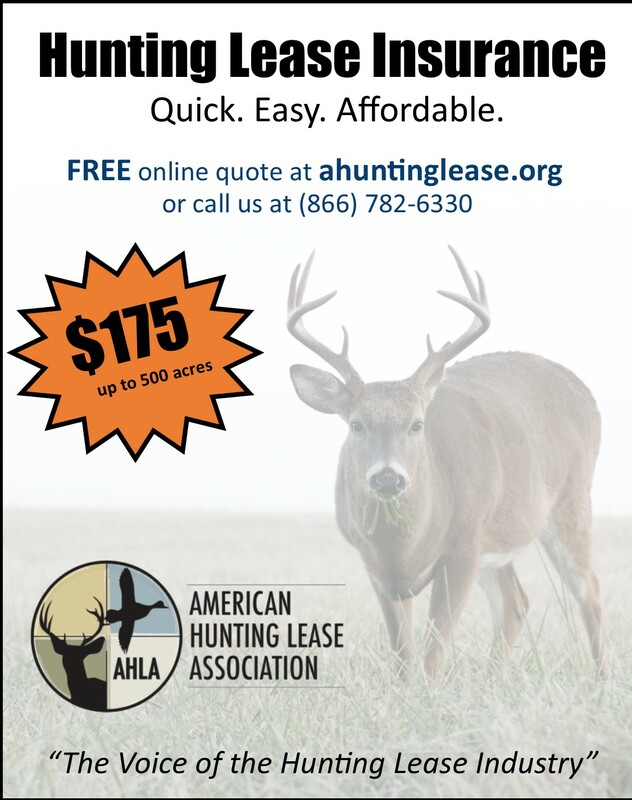 Please visit our website (www.ahuntinglease.org) to get a FREE QUOTE for your lease. The purchase is simple, affordable and can be completed in a matter of minutes. Scroll down to view a flyer you can share with your hunt club. Best of Luck to all of our members this fall.